Oh, and MORE Dragon's Blood Resin Incense Sticks Back in Stock! Best Selling Incense, ever. FOLLOW US ON: Instagram/themagickcabinet and Facebook/themagickcabinet for special coupons, inspiration and spiritual musings. The Magick Cabinet - A Unique Online Metaphysical Shop and Apothecary for your handmade Witchcraft Supplies: Beginner Witch herb kits and altar decor, divination tools like pendulums and runes, Metaphysical healing crystals, some direct from the miners themselves, many different sage wands for your smudging rituals. We offer unique Wicca supplies, handcrafted spell kits and special crystals that always come in a gift bag with their metaphysical properties so you'll never have to guess which stone you purchased. Look for the charmed witch blended perfume oils, ritual oils and anointing oils for use in your own spells. All the magical herb blends are hand blended by me for that extra energy. I've done the hard work for you by gathering the necessary herbs and oils and enchanted them to make your casting easier. We don't just sell to the Witch and Wicca communities. Everyone with a spiritual mind is welcome here. It doesn't matter if your shopping for coven supplies or just want an energetic crystal, we've got something special for you. We ship fast from Burbank, CA and are a trusted Metaphysical store in Los Angeles. Over 4 successful years online with over 10,000 sales and 4400 - 5 star reviews on Etsy. All spiritually minded people are welcome here. Any Witch, Wicca, Pagan, or Metaphysical person will find what we have to offer much more energetic and powerful then the mass produced products so prevalent on the web. Quality occult supplies at a reasonable price. You shouldn't go broke walking on your spiritual path. Please follow us on Facebook and Instagram for coupons, ideas and sneak peeks into what is coming up next. We welcome your feedback and reviews. 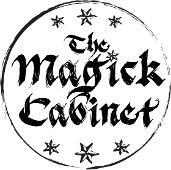 Thank you for supporting The Magick Cabinet and the one woman show that it is.